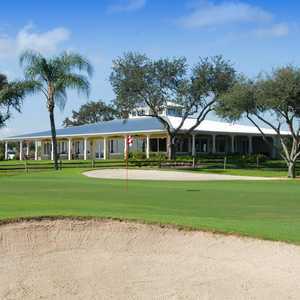 WEST PALM BEACH, Fla. -- In 2007, the Old South golf course at The President Country Club, which opened in 1968, got a completely new look from architect Robert Trent Jones Jr. So massive was the makeover that the Eagle Golf Course, as it's called now, is really a completely new play, although it followed much of the same routing. It's not particularly long at 6,887 yards, but add water on 15 of the 18 holes, and you've got one heck of a challenge. Robert Trent Jones Jr. redesigned The President Country Club's Eagle Course in 2007. A Robert Trent Jones Jr. design, the Eagle Golf Course at Banyan Cay Golf Club & Resort (previously known as President Golf Club) boasts championship Bermuda greens. Jones also lined the fairways with coquina and accented the course with pampas grass, both of which help bring out the beauty of the natural landscape. "The tracking of the front nine is pretty much what it was, with a little bit of tweaking," said Director of Golf Scott Mailloux, who has been at The President Country Club for nearly 40 years. "We added a little more water, but the back nine's almost completely different. We had sold some land to a developer so we had to basically reroute the entire back nine." The President Country Club's Eagle Course is one of two 18-hole layouts at this semi-private club that just opened to the public in 2011. 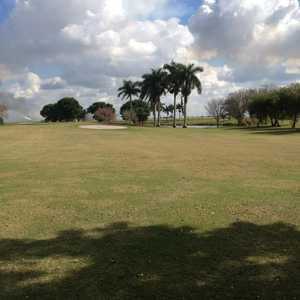 The other 18, the Patriot Golf Course, is shorter with much less water, wider fairways and flatter greens. It's also cheaper to play and tends to be busier, but for the better player, the Eagle Course is probably the choice. There's ample room to drive the ball, but if you start spraying it, you'll be digging deep into your bag for golf balls and using a calculator on the scorecard. It's also important to pick the right club off the tee because driver often brings the water into play much quicker. And even when you get to the greens, the battle continues. "You have to hit the greens in the right areas," said Mailloux. "There's quite a bit of undulation." Even if you didn't know the history of The President Country Club, you would probably guess that it was once a private country club. To get in, you follow a road through a sentry gate and in between high-rise condominiums. The large clubhouse, which was renovated in 2007, still features a large dining room, extensive men's and women's locker rooms and a well-stocked golf shop. The club still has 375 members, around 200 of which play golf. Now open to the public, you can play the Eagle Course for $89 during peak season in the winter, much less in the summertime. 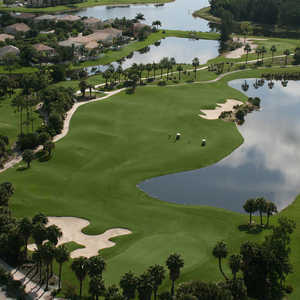 Either way, the Eagle Course is well conditioned and scenic, right in the heart of West Palm Beach. Also unique are the coquina-shell cart paths, which unlike concrete cart paths, are in play and not difficult to hit shots from. In fact, balls hit off the coquina really tend to spin and hold the greens. It's difficult to pinpoint a signature hole on the Eagle Course, especially with all the water. The first par 5, the sixth, could certainly serve that role with a green that sits out on a peninsula. The par-3 16th, which plays around a lake and can be as long as 235 yards, is also picturesque, as is the finishing hole, a 56-yard par 5. When The President Country Club opened to the public in 2011, visitors and locals gained two quality courses, especially the Eagle Course. Even without wind, it's a great test of target golf, but with six sets of tees, it's playable for all levels. Conditioning is also superb, especially with the overseed in the winter. Greens are well maintained, and fairways are plush. The club also has terrific practice facilities, with a full range, large putting green and short-game area. Lessons are also available from the professional staff. Dining is exceptional, maintaining the old country-club feel with a full menu of selections.